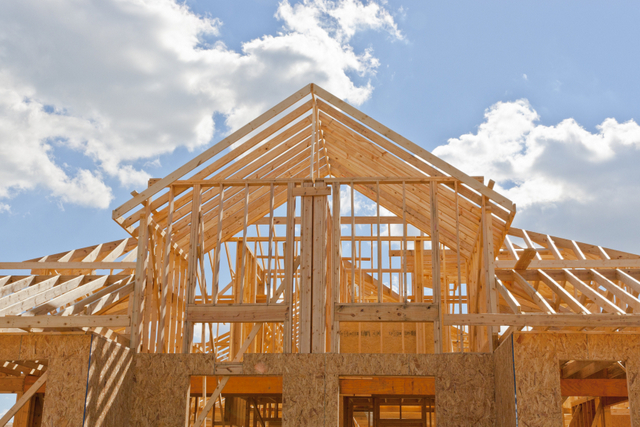 The value of new construction starts in January receded 2% to a seasonally adjusted annual rate of $725.9 billion, easing slightly after December’s 13% hike, according to Dodge Data & Analytics. The nonbuilding construction sector, comprised of public works and electric utilities/gas plants, pulled back 18% after surging 45% in December, as that month was boosted by the start of the $2.3 billion I-66 Corridor Improvements Project in northern Virginia and a $992 million transmission line project in California. At the same time, nonresidential building edged up 1% in January, supported by groundbreaking for the $1.3 billion domed stadium in Las Vegas NV that will be the new home for the NFL Oakland Raiders once construction is completed prior to the 2020 season. In addition, residential building climbed 7% in January, helped by a rebound for multifamily housing after three straight months of declines. On an unadjusted basis, total construction starts in January were $52.2 billion, down 7% from the same month a year ago. On a twelve-month moving total basis, total construction starts in the twelve months ending January 2018 were up 2% from the twelve months ending January 2017. The January statistics produced a reading of 154 for the Dodge Index (2000=100), compared to December’s upwardly revised 156. 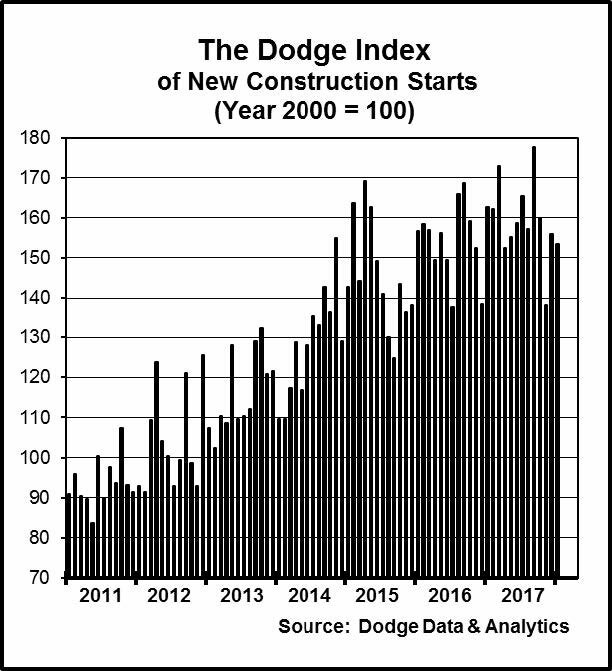 During 2017, the pattern of construction starts frequently showed an up-and-down pattern, which was present towards the end of last year when the Dodge Index fell to 138 in November followed by 156 in December. The 154 reading for the Dodge Index in January, along with December’s 156, shows construction starts climbing back close to last year’s mid-range of activity. For 2017 as a whole, the Dodge Index averaged 159. Nonbuilding construction in January was $153.8 billion (annual rate), down 18% from December’s heightened amount. The public works categories as a group fell 15%, with a substantial 34% drop for highway and bridge construction which had soared 66% in December with the start of the $2.3 billion I-66 Corridor Improvements Project in northern Virginia. In January, the largest highway and bridge projects were smaller in scale — a $230 million bridge in Tampa FL and a $105 million highway interchange upgrade in Virginia Beach VA. Reduced activity was also reported in January for sewer construction and water supply construction, each with 26% declines. The miscellaneous public works category, which includes pipelines and mass transit projects, climbed 20% in January as the $2.0 billion NEXUS natural gas pipeline in Ohio and Michigan was entered as a construction start. The dollar amount of new pipeline projects during 2017 shot up 90% to $22.3 billion, and while that amount may not be equaled in 2018, January’s NEXUS pipeline project shows that at least for the near term major pipeline projects continue to reach the construction start stage. River/harbor development work also strengthened in January, advancing 19% with the lift coming from $260 million for the harbor deepening project in Charleston SC and a $240 million lock replacement project in Chattanooga TN. The often-volatile electric utility/gas plant category plunged 39% in January, following December’s 93% increase. Even with the decline, January included the start of an $872 million gas-fired power plant in Louisiana and a $260 million solar power facility in Texas. Nonresidential building in January was $240.8 billion (annual rate), a slight 1% rise on top of December’s 10% gain. The institutional categories as a group rose 8%, led by a 149% jump for amusement-related projects which featured the start of the $1.3 billion domed stadium in Las Vegas NV for the soon-to-relocate NFL Oakland Raiders. The other institutional project types all showed reduced activity to varying degrees, relative to December. Educational facilities, the largest nonresidential building category by dollar amount, slipped 1%. Large educational facilities projects that reached groundbreaking in January were a $210 million biomedical innovation building for Stanford University in Stanford CA, a $150 million expansion to the Denver Art Museum in Denver CO, and a $100 million exhibition space for the Space Shuttle Endeavor at the California Science Center in Los Angeles CA. Large high school projects that reached groundbreaking in January were in Crofton MD ($96 million), Tyler TX ($95 million), and Boiling Springs SC ($95 million), among other localities. Healthcare facilities retreated 10% in January, although the latest month did includethe start of several large hospital projects, such as the $254 million Hubbard Center for Children Medical Center in Omaha NE, the $120 million replacement for the Memorial Hospital Complex in York PA, and a $109 million medical center renovation in Canandaigua NY. The remaining institutional categories showed these January declines — transportation terminals, down 6%; religious buildings, down 23%; and public buildings (courthouses and detention facilities), down 25%. The manufacturing plant category strengthened in January, climbing 99% after a weak December. Major manufacturing projects that were entered as January starts were a $400 million portion of an upgrade underway at a semiconductor plant in Chandler AZ, a $200 million aerodynamic testing center for the Ford Motor Company in Allen Park MI, a $110 million food processing plant in Longmont CO, and a $105 million expansion to a food processing plant in Jack AL. The commercial categories as a group fell 15% in January. New office construction starts retreated 31% after a sharp 44% jump in December which included two large Facebook data centers, located in Sandston VA ($750 million) and Prineville OR ($400 million). The largest office projects that reached groundbreaking in January were a $350 million Facebook data center in New Albany OH, a $160 million office building in Washington DC, and the $140 million renovation to the Portland Building in Portland OR. Hotel construction dropped 13% after a 4% gain in December, although the latest month did include the start of a $300 million hotel in New York NY. The remaining commercial categories witnessed this performance relative to December – stores, down 2%; warehouses, unchanged; and commercial garages, up 4%. Residential building in January was $331.3 billion (annual rate), up 7%. Multifamily housing jumped 39%, showing renewed strength after the loss of momentum that took place during the closing months of 2017. During January, there were eleven multifamily projects valued at $100 million or more that reached groundbreaking, compared to four such projects in December. The largest January multifamily projects were the $260 million multifamily portion of a $289 million mixed-use complex in San Jose CA, a $250 million multifamily high-rise in Jersey City NJ, and a $175 million multifamily high-rise in Houston TX. In January, the top five metropolitan markets ranked by the dollar amount of multifamily starts were — New York NY, Miami FL, Boston MA, Houston TX, and Washington DC. Metropolitan areas ranked 6 through 10 were — San Jose CA, Philadelphia PA, San Francisco CA, St. Louis MO, and Seattle WA. Single family housing in January receded 3%, settling back after the modest gains reported during the previous five months. In January, single family housing showed this pattern by major region — the West, down 11%; the South Central, down 2%; the South Atlantic, down 1%; the Midwest, unchanged; and the Northeast, up 9%. The 7% decline for total construction starts on an unadjusted basis for January 2018 relative to January 2017 was the result of a mixed performance by major sector. Nonbuilding construction increased 4%, with public works up 6% while electric utilities/gas plants dropped 6%. Nonresidential building fell 20% from a very strong January 2017 which included such unusually large construction starts as the $3.6 billion Central Terminal Building replacement project at LaGuardia Airport in New York NY, the $600 million McClellan Business Park data center in McClellan CA, and a $477 million terminal project at San Francisco International Airport. Compared to the same month a year ago, the institutional and commercial building segments of nonresidential building were down 23% and 21% respectively, while manufacturing plant starts advanced 18%. Residential building rose 1% from the same month a year ago, with single family housing up 3% while multifamily housing slipped 2%. By geography, total construction starts for January 2018 relative to January 2017 registered this pattern — the Northeast, down 36%; the West, down 10%; the South Central, down 9%; the South Atlantic, unchanged; and the Midwest, up 42%. Useful perspective is made possible by looking at twelve-month moving totals, in this case the twelve months ending January 2018 versus the twelve months ending January 2017, which reveal total construction starts advancing 2%. By major sector, nonbuilding construction grew 2%, with public works up 12% and electric utilities/gas plants down 29%. Nonresidential building increased 3%, with institutional building up 7%, commercial building down 5%, while manufacturing plant starts climbed 26%. Residential building grew 2%, with single family housing up 8% while multifamily housing fell 12%. 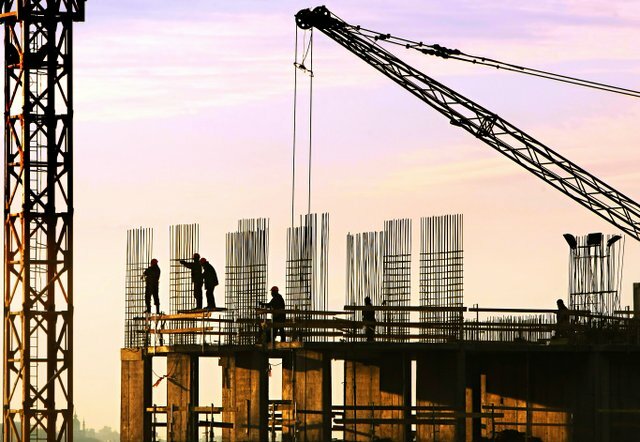 Read more construction stats from Dodge Data & Analytics here.